A political action committee linked to House Speaker Nancy Pelosi (D., Calif.) pushed a total of $250,000 to an activist campaign that was primarily bankrolled by liberal billionaire George Soros, Federal Election Commission filings show. The House Majority PAC, the Pelosi-affiliated group dedicated to electing Democrats to the House of Representatives, this past election cycle made numerous transfers to the "Win Justice" campaign, which was launched by a handful of liberal activist organizations including Planned Parenthood Votes, Color of Change PAC, Service Employees International Union (SEIU), and the Center for Community Change. The group would work to push minority, young, and woman voters to the polls in Florida, Michigan, and Nevada. The network created an affiliated federal PAC—the Win Justice PAC—to fund their efforts. The PAC is operated by Deepak Pateriya, the chief of staff at the Center for Community Change Action, a left-wing Washington, D.C.-based nonprofit that is regularly involved in protests and direct action against President Donald Trump and Republicans. Deepak Bhargava, the executive director of the Center for Community Change, is a part of Soros's 12-person advisory board for U.S. Programs at his Open Society Foundations. The Win Justice PAC was given $3.7 million from committees including SEIU Cope, America Votes Action Fund, Civic Innovation, and Planned Parenthood Votes. The Pelosi-linked PAC ultimately sent a total of $250,000 in funds to the Win Justice PAC throughout the cycle, according to filings. However, the PAC received a majority of its funds from deep-pocketed billionaires. The PAC reported $7.8 million from individuals, $5.2 million of which came from Soros, who was the PACs first and sole donor for some time after its launch. 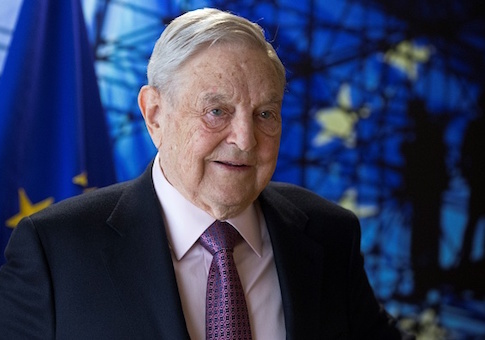 Later donors to the PAC included billionaire financier Donald S. Sussman, Hollywood filmmaker Steven Spielberg and wife Kate Capshaw, Soros's daughter-in-law Andrea Soros, real-estate mogul George Krupp, and Weston Milliken, a secretary at the Democracy Alliance, the left's largest dark money donor network in which Soros is a top member. The Democracy Alliance, founded in 2005, consists of more than 100 liberal donors who have steered more than $600 million to liberal organizations and infrastructure since its inception. Pelosi has appeared alongside Soros at the group's secretive conferences to deliver keynote addresses to the donor network. Gara LaMarche, the president of the Democracy Alliance who previously worked at Soros's Open Society Foundations, sat on the advisory board of the Center for Community Change, the group whose sister organization operated the Win Justice campaign's federal PAC. The Center for Community Change and Color of Change, another organization involved with Win Justice, are both recommended groups for funding by the Democracy Alliance. In addition to targeting infrequent voters, the Win Justice campaign spent hundreds of thousands backing candidates such as former Sen. Bill Nelson in Florida, who lost his election to Rick Scott, Ellisa Slotkin, who won her race in Michigan's 8th congressional district, and Rep. Jacky Rosen, who was elected to the U.S. Senate in Nevada. The House Majority PAC did not respond to inquiries into the money it gave to the Win Justice effort by press time. This entry was posted in Politics and tagged George Soros, Nancy Pelosi. Bookmark the permalink.